Happy Friday! I can’t believe how quickly this week has gone, but I feel like I say that every Friday. This has been a really great week for reading, even though it may not look like it. I had some great bookish surprises come through, let’s take a look! I only manged to read two books this week, but not only are they pretty huge (831 pages total), they’ve also been on my TBR for an absolute age. Shadows of Self and Bands of Mourning are the last two books in the Mistborn series. I absolutely adore the original Mistborn trilogy. It has one of the best magic systems ever created and the best trope-twisting. I’m not as huge a fan of the second set of books though, which take place several hundred years after the first. I find the characters to be less to my taste and the western setting isn’t really for me. But I love the way he pulls in threads from the original books — you can actually see how the events of the first trilogy shape the world. Now that I’ve finished these I’m going to read the short stories, which are reportedly amazing, and loop back round to the first one for my book club. I am loving The Last Namasara, although I’ve been neglecting it in favour of the Mistborn books. I’m really looking forward to tucking into this one over the weekend! I’m planning to have a review reading for the publication of the physical book on the 14th of October — the eBook is already out. I’m loving Jane Eyre, but haven’t really had a good chance to get into it. I’m aiming to be 100 pages in by the end of the weekend. I ordered two books from Blackwell’s the other week, which is really unusual for me! I almost never buy books online — I much prefer browsing a real bookstore because I have a terrible memory for what I want to pick up. But I desperately wanted The Star-Touched Queen and couldn’t find it in either of the massive bookshops near me. I ended up giving in and buying it and An Enchantment of Ravens online. An Enchantment of Ravens was dispatched separately and hasn’t arrived yet (which is why it is not listed above), but I’m hoping it’s waiting for me when I get home! I missed out on proofs of Zenith at YALC (I was so close but they ran out!). So when I saw they had some in the office via Twitter, I had to reach out and ask. I wasn’t sure if I had made the list or not, so I was thrilled to see a shiny package on my doorstep! It doesn’t come out until January next year, but I might read this one early. I have been approved for four new amazing titles from NetGalley since my last weekly wrap-up. I’ve been hearing so many amazing things about all of these books, but I think I am going to start Genuine Fraud or The Seven Deaths of Evelyn Hardcastle first. I’ve been neglecting my digital ARC’s in favour of my physical ones, so this might be something I tie into my November TBR. I cannot believe it, but I managed to snag my very first Fairy Loot box! If you don’t know Fairy Loot, they’re a UK-based book subscription box that focuses on fantasy books and other goodies. You can check them out here! Despite server meltdowns and frozen computers, I will be receiving November’s Girls that Slay box. I also happen to have a few more grey hairs after that process, yikes! I’m planning to do a full unboxing on my YouTube channel, so keep an eye out! I’m so incredibly excited for this. In other bookish news, I was lucky enough to attend Margaret Atwood’s talk in Oxford last night. My friend and I got tickets ages back, and the date finally arrived! It was completely amazing. We were in the Sheldonian Theatre, which is a pretty impressive venue, and she talked about so much from her new book Hag-Seed to writing as a form of revolution. It was so good and I’m so glad I got a chance to go! If you bought the ticket that included the book, you got a signed copy of Hag-Seed. I already had a paperback, so I didn’t get the book. My friend swapped her signed copy for my unsigned one because she’s the best person on the planet. I’m pretty sure I owe her a blood oath now. So that’s it for this week in books! It has been a pretty spectacular week for books. I’m hoping to start reading a little bit more and maybe reach a goal of 100 books read this year. I’m not sure how well that will go, but I’m getting close! Now it’s your turn! What did you read this week? 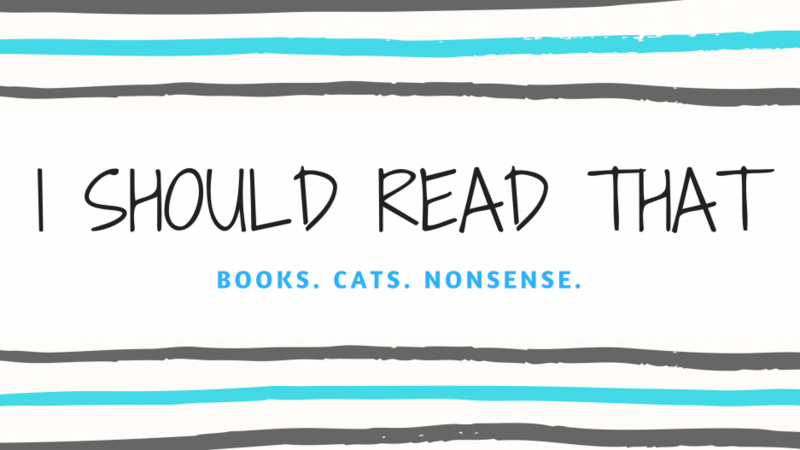 Are any of these books on your TBR? What are your weekend reading plans? Let me know! I remember having to wait for absolute ages! I’m not a very patient person! Love the picture of your cat! Wow you had a great week! I can’t wait to see what you think of The Last Namsara. I’m on the fence with it. And ZENITH! Can’t wait for that one! Yeah, I need to get out of the habit of calling it a trilogy! I thought it was finished until literally a week ago, when I found out there was going to be another book. He’s a robot! I really love a couple of the characters (Steris and MeLaan), but the rest of them fall really flat for me. I think it’s just to do with the world and society they live in — it just doesn’t suit me and my tastes as well as those first books do! I am really excited for Everless! It looks like a fun one. I hope it goes up in the US soon! How expensive is the shipping for Fairy Loot to the US?? All the US boxes seem so crazy expensive to have shipped here! Yeah some changes aren’t always for everyone. I agree with both their characters; I loved the arc he had for Steris. When I paid for mine it was more than $10 but you can track it. So I’m just like “Okay, first box that I’m buying…at least I can track it” lol. How much was it for yours? So lucky you got Zenith! I emailed and tried to get a copy because one of my favorite authors, J.D. Netto, designed the cover. Me too! I will definitely be buying it when it comes out though!